North of Duns, the low-lying Lammermuir Hills, with their extensive grouse moors, rolling farmland and wooded valleys, run east to west along the border with East Lothian. The hills are popular with walkers and there are numerous trails, including a section of the Southern Upland Way. 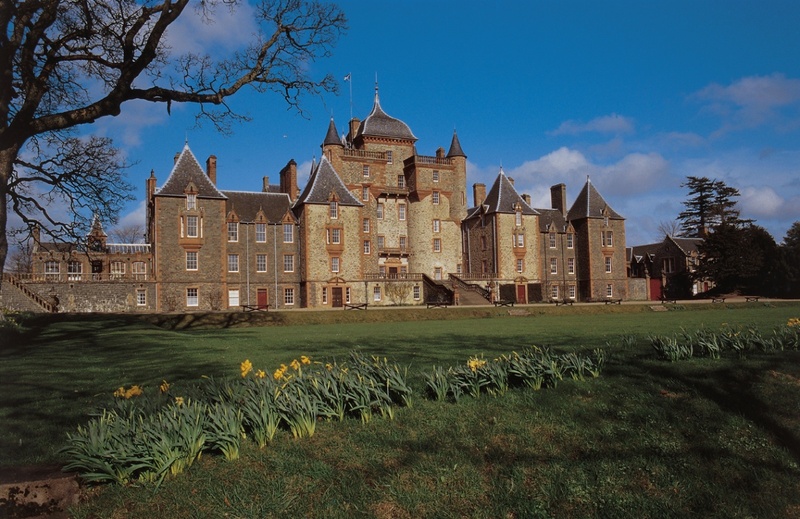 To the West, the Way can be accessed at Lauder, where it passes through the grounds of Thirlestane Castle. The narcissism and folly of the aristocracy is evident here perhaps more than in most ‘great homes’. Notice how many of the family portraits adorning the walls look similar? The extensive assemblage here is the result of the common practice of mass production used at the time. Many of the family have almost identical features, as the same bodies were used for their portraits with different clothes, faces and hands superimposed. Thirlestane is also home to some of the finest plasterwork ceilings in Europe, and don’t miss Henry the Ram (a snuff box) in the dining room – kitsch beyond kitsch. Lammeruir Hills is a must see attraction on your tours of Scotland.